While other may offer a price match. Curacao continually reviews its lending rates and tries to ensure that our customers pay competitive rates on their outstanding debt. In fact, some customers are offered an interest rate that is lower than the competition’s store credit card, but we are not perfect. 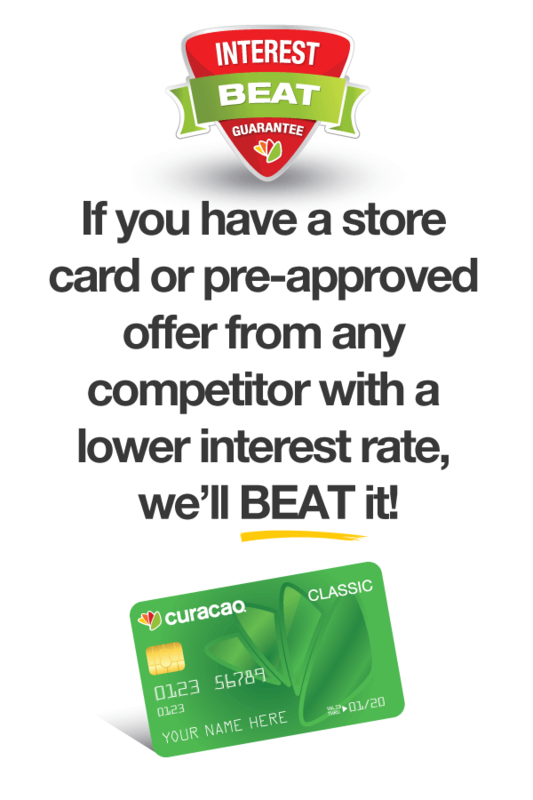 With Curacao’s INTEREST BEAT GUARANTEE, we will not only match the competitor’s interest rate, but we will BEAT it! That is our promise. 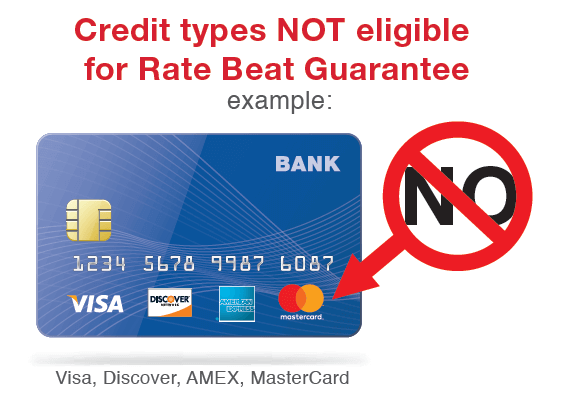 If you have a “co-signer” on the competitor retail store card which allowed you to qualify for the credit account and rate, then you may qualify for Curacao’s Interest Beat program if you also have a co-signer on your Curacao credit account. What credit cards will you beat the interest rate? Competitor “store card” is defined as a credit card issued with the name of that retailer on the card (regardless if a bank is managing the account) that is not co-branded with a major credit card association. Retail competitor store cards typically have restricted usage of credit for purchases at the retailer’s store locations. Can I request Curacao to beat another card’s rate at any time? Can I do this for current balances? Revolving (Express-99, Regular-50’s) sub-accounts – if all requirements are met, current balances are eligible for lower interest rate and will take effect as of the date granted (i.e. intra-billing cycle). Finance charges assessed on existing balance up to the date of Interest Beat program interest rate change are calculated based on the previous sub-account interest rate. Finance charges for the remaining days of the billing statement will use the changed interest rate. For this reason, the weighted average interest rate for your first billing cycle under your new lower “Interest Beat” rate may be slightly higher due to finance charges which were already assessed on pre-existing balance at the previous old rate. How can I request an INTEREST BEAT on my account? Click here to submit your Interest Beat request online. Make sure to include your name, account number and the best phone number to call you back along with required documentation. What will my final interest rate be? Once we confirm your eligibility, we will match the competitor’s store credit card and BEAT it by an additional 0.25%.